Woody and Cardoza hear they won best overall and best writing submission. 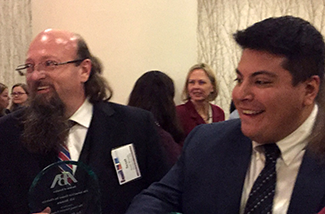 Surprise and elation spread across the faces of UNM Law School students Frank Cardoza and Scott Woody at a dinner during the midyear meeting of the ABA’s Section of Taxation. They had just heard that they won best overall and best written submission in the J.D. division of the 15th Annual ABA Law Student Tax Challenge held in Los Angeles on January 29, 2016. Both say it was one of the best experiences they had in law school. It was tough; the preparation took months of hard work, including numerous oral presentations to law school faculty and alumni; and they faced fierce competition against 65 other teams from law schools throughout the country. And both agree that the payoff was huge. They applied classroom knowledge to real world scenarios, received support from the law school and the local law community, and had abundant networking opportunities before and after the competition. "The win demonstrates the knowledge of our professors and the quality of a UNM School of Law education," says Woody. Cardoza agrees, adding, "This opportunity helped me apply the skills which I have accumulated for the past three years and has shown me the value of the education I received." UNM Law School students Scott Woody (l) and Frank Cardoza with Professor Mary Pareja at the ABA Student Tax Challenge on January 29, 2016. Photo by Robert Johnston. Cardoza and Woody entered the competition in the fall with the encouragement of Professor Mary Pareja. "Scott and Frank worked very hard to win this competition, and I am so very proud of their effort," says Pareja. "Through this competition, they had the opportunity to meet Tax Court judges, practitioners and representatives of LL.M. programs – what an incredible and well-deserved opportunity for them." The competition consisted of two distinct components. The first was a 10-page memo to a Senior Partner and a 5-page letter to the Client responding to a hypothetical client situation. Cardoza and Woody spent about a month developing the issues and researching applicable statutes, Treasury Regulations and cases. Then they spent about another month writing and re-writing the papers. Cardoza says that was the most difficult part of the competition. 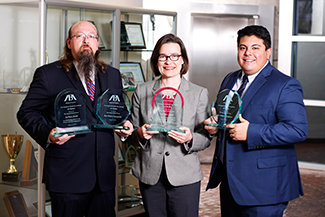 From that written submission, Cardoza and Woody were among six teams selected to advance to the semi-final competition at the ABA meeting in Los Angeles. Most of their travel expenses were covered by the ABA Section of Taxation. During the semi-final round, Cardoza and Woody orally defended their work to the Partners and Client in a mock client meeting. To prepare, they practiced presenting to Professor Pareja, Professor Desiderio, Adjunct Professor Weinstein, who is a partner at the law firm of Holland & Knight, as well as to Tracy Sprouls and Robert Lucero, both UNM Law School alumni who practice at the Rodey Law Firm. Pareja says the team is very grateful to everyone involved in helping the students, adding "this competition really highlights the partnership between the school and the local bar that makes our community so special." The competition has very strict rules for the type and amount of assistance students could receive during both phases of the competition. Pareja says the team followed the rules at all times even though it was difficult at times to do so and suppress the urge to explain things to the students, but that in the end it was a much better learning experience for them. "The Tax Challenge was one of the best experiences that I have ever had in law school," says Cardoza. "The tax community, as a whole, was extremely welcoming and encouraging. The amount of networking before and after the competition has broadened my horizons and has presented opportunities which I did not think were otherwise possible." "The Tax Challenge was a wonderful experience as it allowed us to apply classroom knowledge to real world scenarios," says Woody. "In addition, the ability to defend our memo to the Partners and Client is a skill we will need once we begin practice."